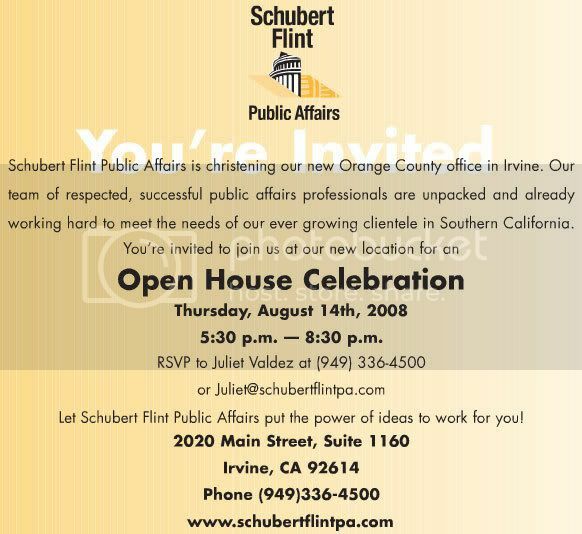 The GOP consulting firm Schubert Flint Public Affairs is led by Frank Schubert and Jeff Flint, who also co-manage the Yes on 8 campaign. This is a golden opportunity to interact with the principals, staff and clients of the leading PR firm behind the latest effort to ban gay marriage in California. 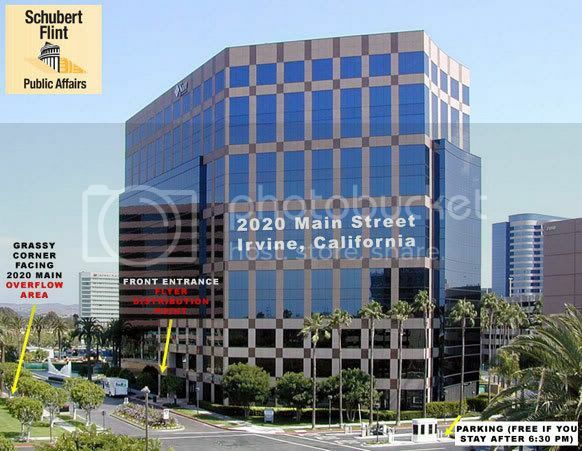 If you live in Orange County, oppose Proposition 8, and can afford to donate three hours of your time this week, I invite you to spend those three hours this Thursday evening in front of 2020 Main in Irvine. If you're interested in participating, please leave your comments below. Thanks! And don't forget to bring your digital camera or camera phone with you to 2020 Main on Thursday. We're looking forward to seeing some photos of the action! No person shall interfere with the exercise of free speech rights by persons within areas open to the general public in shopping centers, apartment complexes and other private or public property open to the general public. As used in this section, "free speech rights" shall mean the right to freedom of speech, the right to solicit and collect signatures on petitions and the right to distribute literature or display temporary signs or placards of a political nature; provided such activities do not result in the obstruction of entrances, exits or passageways or create a threat to public safety. FYI, I work in 2020 Main, and the parking attendants leave by 6:30 everyday, so those attending that night do not need to worry about paying for parking if they stay past 6:30. Chino, just read your comment on JMG. I'm on the ECCO Board of Directors (www.eccopac.org) and sent this info out to other board members. (I'm in NY so can't attend.) If you'd like to be added to our mailing list for Voter Guides, send me an email at eccopac@yahoo.com. Chino -- I published your comment but I would like to give it a little more exposure by posting an "Action Alert" on my blog (http://desertspeak.blogspot.com/) about your planned demo. I have a couple of questions but, unfortunately, I couldn't find an email address or any other kind of contact info for you. Please contact me at gandolf2u@cox.net as soon as possible so I can get this posted ASAP. chino like steve above I posted an action alert on my blog but would like to include an email or number for people to contact you. 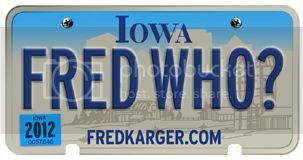 feel free to swing by my blog and leave it as a comment, thanks. Chino - just posted your update info - thanks. I wish I were back in CA (I lived there for about 15 years), I would LOVE to go to this! Steve - I hear ya' - I'm so wishing I was still local. Anyway, wanna know what really makes you a hero? Vern sent me his telephone number as 714-235-VERN (obviously he assumed I'd have a clue about how to translate VERN into actual digits). ah, this post answers my question about your real leanings. way to go! terrierchica - I'm confused - who is your post directed to and what are you referring to? What are you guys doing commenting on this old thread? I need your help over on the new one! I'm posting here because after you linked me to your site I get emails whenever anyone puts up a new post. I'll go back to your home page and check out what you need help on.